Before you freak out and wonder how there is such a thing as leftover Ramen Tatsuya, remember that patience is a virtue that is highly rewarded. You'll find this in my freezer. 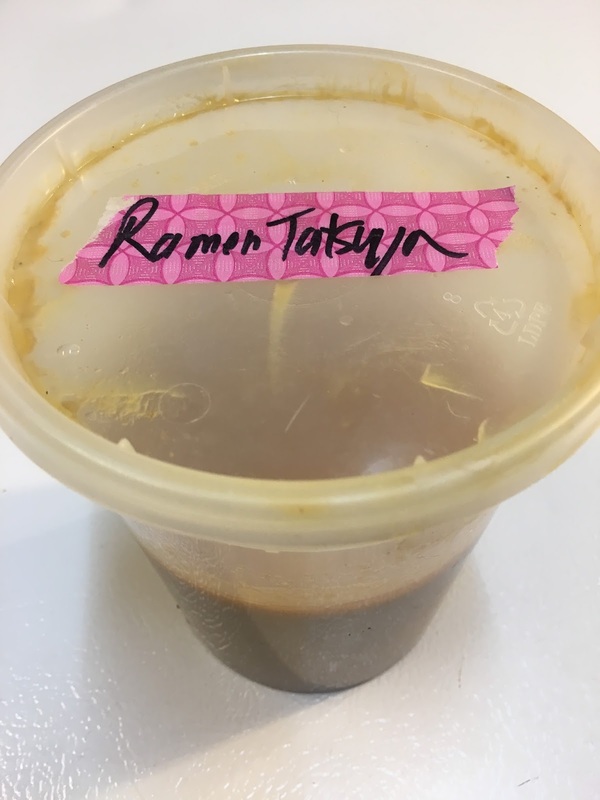 Short of getting someone else to bring Ramen Tatsuya to you, you can save your leftover broth for a rainy day. 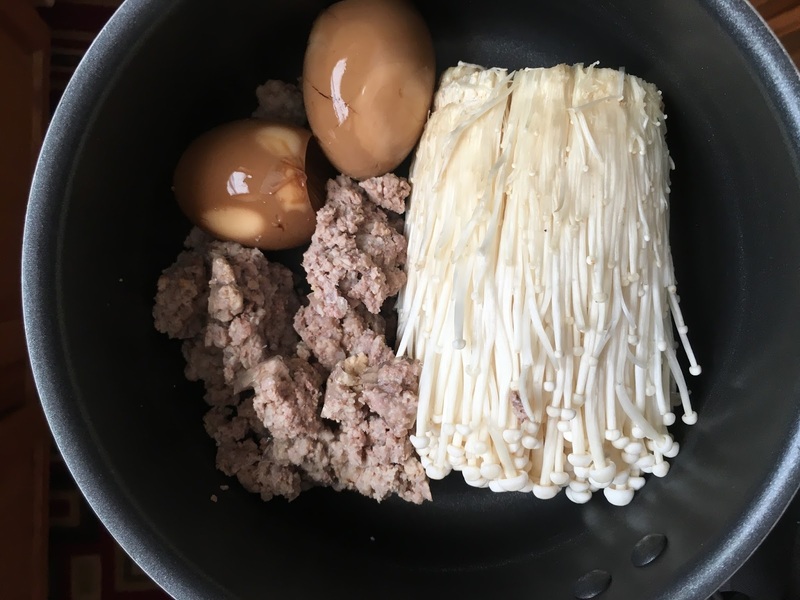 I started saving my broth after devouring the slender noodles, soft yet structured eggs, and tender meat in the to-go containers. When I get home, I pour it into a sturdier container and freeze it until I’m ready. I’ll often add many visits worth of broth into the same container. 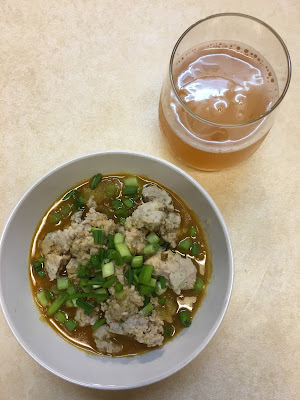 While there’s many things you can do with the broth, I’ll go through my typical routine. I’ve also condensed the broth and served it with leftover pork chop from Perry’s. I used spaghetti squash once, but I didn’t love the results. The squash didn’t have enough texture to hold up to the broth. 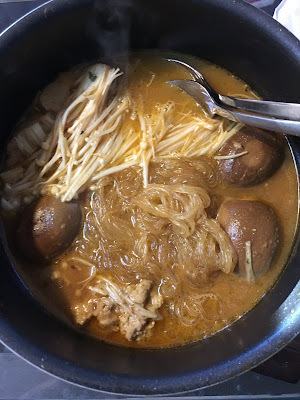 I've also used cooked shredded napa cabbage, which is quite nice. Enoki mushrooms purchased at an Asian Supermarket. When thinking about serving up leftover ramen broth, start by thinking about what types of add-ins that you want. Ground pork, enoki mushrooms, and marinated egg are my go to favorites. If I’m feeling like some carbs, I will bring out the transparent rice noodles often used in hot pot / shabu shabu. 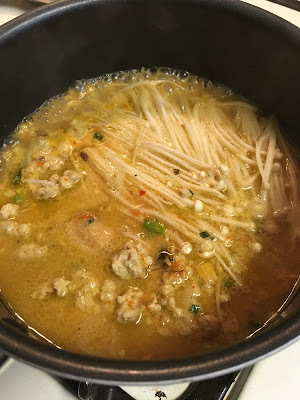 Any type of noodle will work great. My ingredients in the saucepan. For the ground pork, you’ll want to saute it up in a pan or use your Instant Pot. I like to add minced garlic or fried shallots to mine. 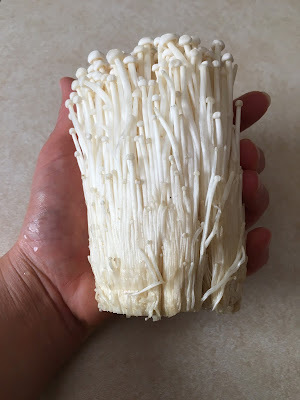 When I use enoki mushrooms, I simply wash them and cut off the root part until I am ready to use them. For egg marinade, I simply put eggs into a mixture of 50:50 soy sauce to water. I don’t simmer it like you do in many marinated egg recipes, nor do I add all the extras. Sometimes I’m just not motivated enough to get all the ingredients out. Warmed up and ready to eat. 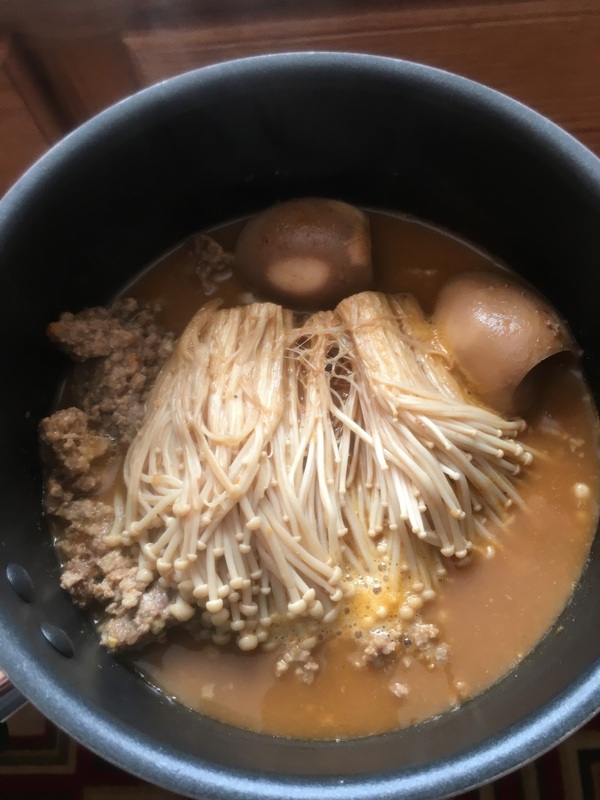 To serve the leftover broth, I let it defrost in the fridge for a day or two. I heat it up in a saucepan, and then I add it whatever I want. If it is enoki mushrooms or noodles, I’ll add those 2-4 minutes (depending on the types of noodles) before I add in the other ingredients. Because I believe in conserving water by not doing unnecessary dishes, sometimes I’ll eat it directly out of the saucepan. Serve with a beer, and you can enjoy Ramen Tatsuya at home without ever leaving the kitchen. Or you can find every opportunity to visit Ramen Tatsuya. When I was on my way to Brussels, Belgium from Antwep hopping back on a train, I picked up a waffle (wafel) at the train station. I selected a plain waffle with a sheer dusting of powdered sugar. The lesson I learned was not to judge a waffle before you take a bite. This waffle was one of the most incredible things I have ever tasted. The outside was uniformly golden brown with a crust that makes its presence known. The inside was soft pillowy carby goodness with a sweet crunch of caramelized sugar. I became obsessed with these waffles. They bore little resemblance to their thin, tough, and limp US counterparts. I found that a food truck in Austin served legit wafels. I have confirmed that they make a dough (legit) as opposed to that pale liquid waffle batter that you get at hotel hot breakfast bars. 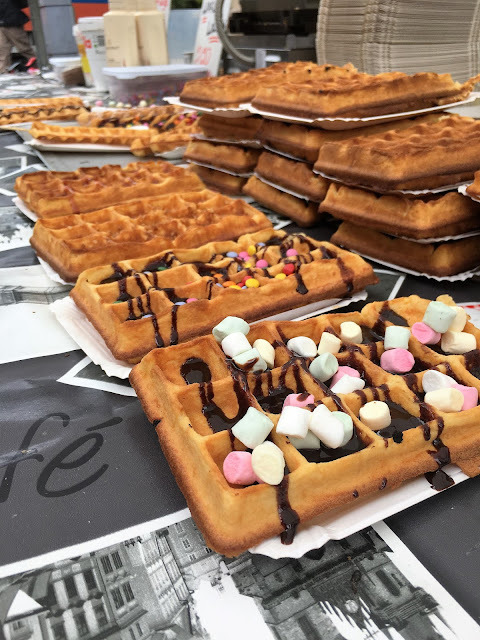 Wafels come with an assortment of toppings and dips in Belgium. And I took it upon myself to figure out how to make them. After spending hours (yes, hours) researching the thickest waffle makers available and reading up on recipes. I thought I was a ready. I purchased Presto Flipside Belgian Waffle Maker that was touted to deliver the thickest waffles. I’ve baked many things in my lifetime, and the yeast-y dough of the leige waffle was well within my skill set. I made my own pearl sugar, and I tried a few haphazard batches based off the Smitten Kitchen recipe. I will admit that cleaning up a waffle iron is too much of a trouble, and I shouldn’t be making leige wafels at home that often anyways. I don’t need to spend time getting caramelized sugar off an iron that doesn’t have removable plates nor does my rear need that many waffles. 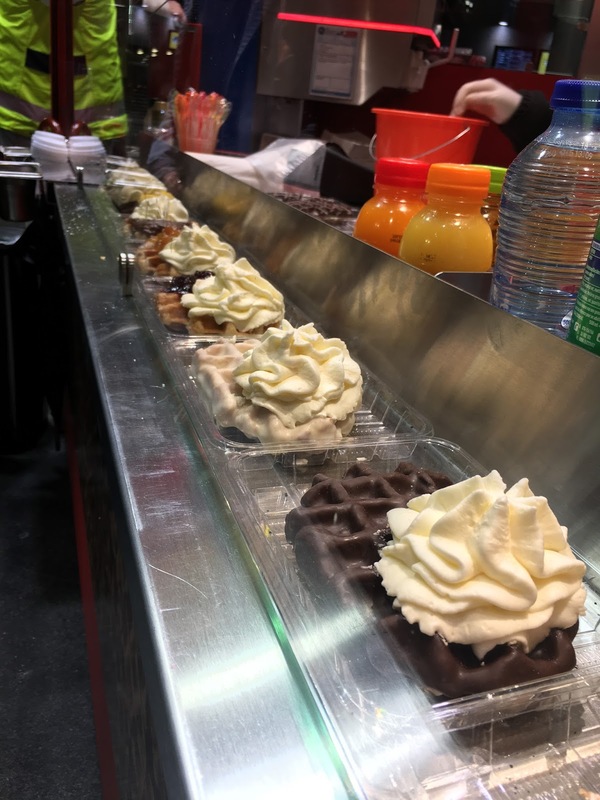 The Wafel Guys should be my go to when it is time to treat myself to a taste of Belgium, in moderation of course. Fortunately for me, the day that I decided that leige wafels should not be made at home, I walked by a sample cart at Costco with waffles. I was skeptical that something so amazing could come out of a plastic clamshell from an American warehouse store. A pack of 12 are 6.99. These are a seasonal item. Again, I was wrong. 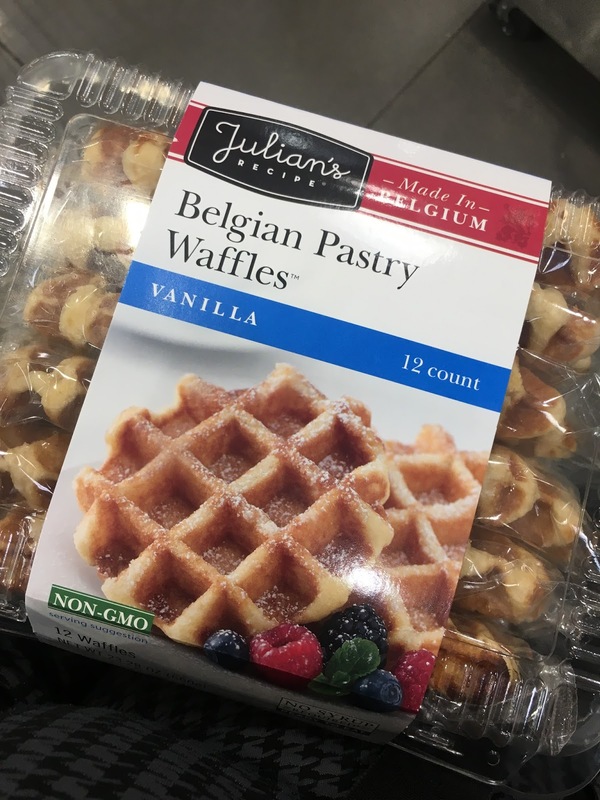 Julian’s waffles are amazing. You can purchase them on Amazon if you don’t have a Costco membership, and some grocery stores may carry them as well. It looks like I can pick some up at my local grocery chain. Wafels are in high demand. I demand one right now! Per capita, I might guess that Leiden has the most museums with a population of 117,915 (2011 data). 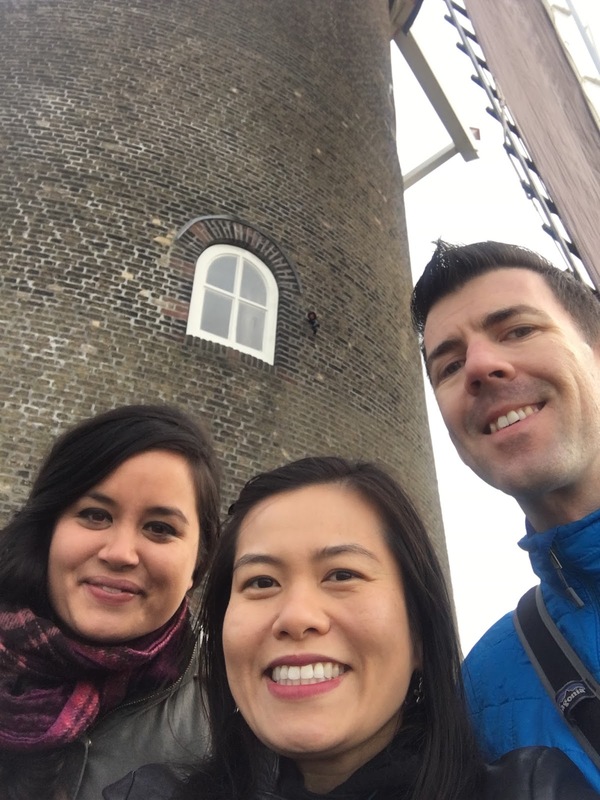 Leiden is just a quick train ride from Amsterdam, and I was excited to meet my friend, Maud there. Though continents and oceans away, Maud and I share a deep love for the Greater Swiss Mountain Dog. It is amazing how the dedication to a breed can lead to almost a decade of friendship. I would be remiss if I did not mention Maud’s photography. Her ability to capture the essence of dogs is incredible, and I will always be in her debt for her photographs of Mouse. 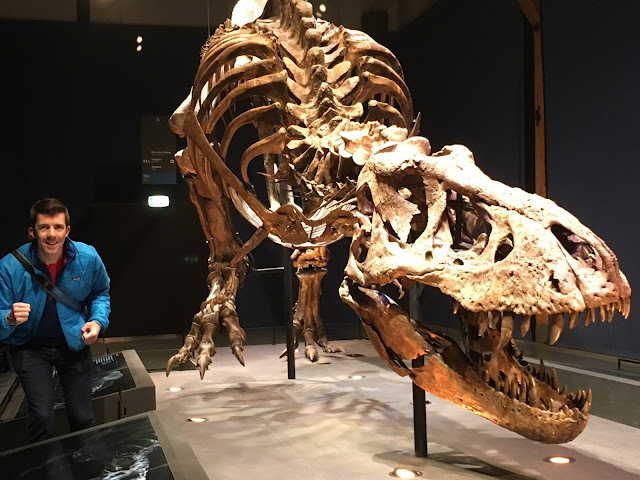 While in Leiden, we made a visit to the Naturalis Museum that happened to be showcasing the most complete (80%) Tyrannosaurus Rex skeleton affectionately named Trix. Trix was found in Wyoming and transported to the Netherlands with a festive welcome. She’s guessed to be around 30 years old. There were animatronic dinosaurs in the museum, some 3D printers, and even a selfie station setup to get photos right in front of Trix. Though Trix was a single display, the museum had a very clever ways of packing in a good bit of information into the display. There were educational pieces on how they assessed events that happened in her life due to evidence on the skeleton. However, I personally find it difficult to see the difference between damage to the skeleton when the creature was alive versus damage to the skeleton after being buried in Wyoming for 66 million years. That’s a failing on my part, not the scientists’ part. While Trix is impressive and the museum was filled with interactive games, the most exciting discovery for me there was the kenetic sand. The very last interactive section of the museum intended for children. Kinetic sand doesn’t look any different from afar, but one touch of the sand had me intrigued. The sand was moldable and holdable like a plasma, but it also separated and fell apart like regular same. You’re better off buying some to try for yourself. Amazon carries it at ~$25 for 3 lbs, and your inner child will thank you. 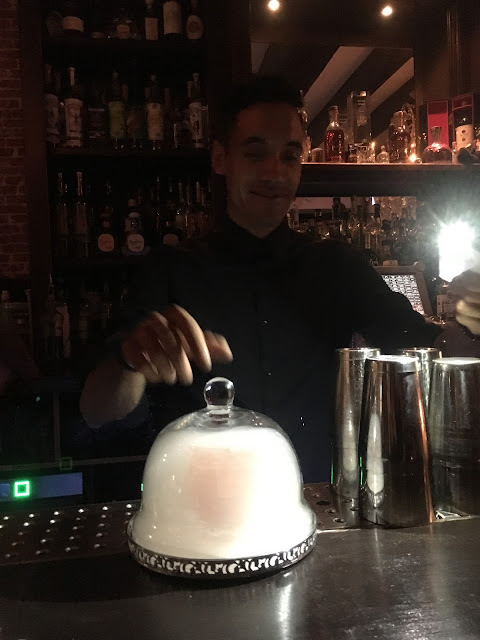 Our last stop in Amsterdam was a at Tales and Spirits, a romantically dim bar that serves creative cocktails with a splash of showmanship. When you visit Tales and Spirits, be aware that they have rules, and one should abide by them. You are seated by the host, and table service is provided. No milling about or other unclassy behavior. When I was here, I tried a genever (also called jenever, genièvre, peket or Dutch gin) straight up which is supposed to taste like gin. The one I tried was aged in barrels and had taken on more of a woody and smoky sweet flavor as opposed to a brighter herbalicious flavor. All patrons are served a snack of lentil chips with housemade chutney. The concoction that night included pineapple, allspice, ginger, and chiles. The humble bartender who created it refused to tell me much else about it, but at least I have a flavor profile to use as a starting point. If you’re looking for cocktails that are equally a visual treat as they are a flavor and aroma treat, try the Zombie or the Smoke and Mirrors. The Zombie is a Tiki style drink that serves two for 15 euros. It boasts four different types of rums, pineapple, lime, and grapefruit juice alone with falernum, cinnamon syrup, passion fruit, absinthe, and bitters served in a giant zombie tiki mug that is about the size of your head. 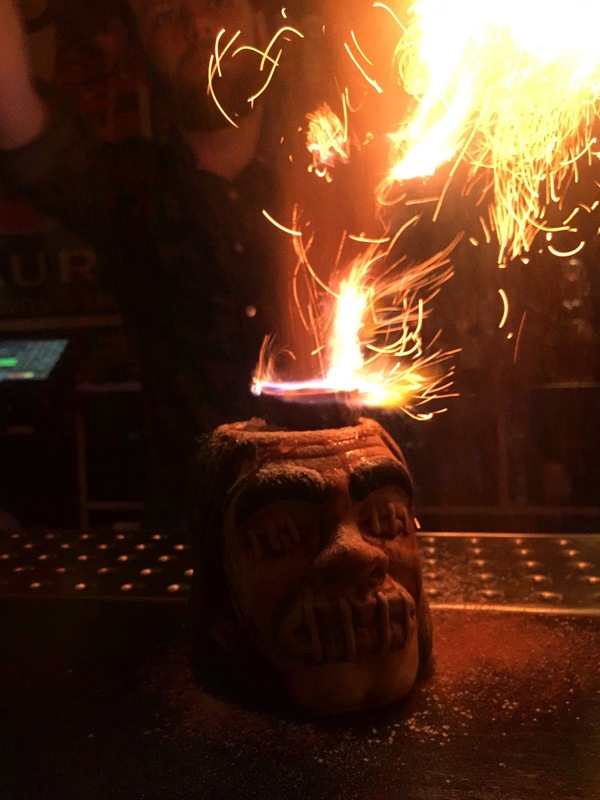 A halved passion fruit filled with rum is set on top of the drink which is then set on fire. Then the entire thing is sprinkled with powdered sugar and cinnamon that creates a personal bartop fireworks display. I’d get this again just to watch it being made. This Zombie is on fire! The Smoke and Mirrors was a bit more mysterious in nature. It includes Ketel One vodka, Martini Gran Lusso vermouth, Pierre Ferrand dry Curaçao, strawberry-basil shrub, olive oil and rosemary presented in a cake dome filled with smoke. The drink was sweet and aromatic with the smoke and rosemary. I kind of can’t get over the presentation though. Smoke and Mirrors about to be released! And lastly, if you feel like you have too many euros to spare, there’s a cocktail on the menu that will help you lighten your wallet. For 225 euros, you can get “the way it was,” a cocktail with Bacardi "Ron de Maestro" MMXII vintage rum, Wildflower honey, Original Abbott's bitters (100+ years old), and orange zest. The bartender commented that it was the Original Abbott’s bitters that was the pricey ingredient of this cocktail at something like 50 euros a drop or something. You can purchase a recreation of Abbott’s bitters now for just $34 for 100 ml. I can’t tell you whether or not it will be comparable to the original though. If you can’t find something on the menu that tickles your fancy, then let the bartenders know your preferences and trust that you will get something delightful!